NEW YORK, New York — The Hayastan All-Armenian Fund continues to expand the geographical reach of its operations. Recently, two more affiliates were launched in Argentina and Uruguay, further extending the organization’s worldwide roster of local offices. The establishment of the Latin American affiliates was assisted by Hrach Hovhannisyan of the Fund’s Executive Board. In August, during a string of visits to Brazil, Argentina, and Uruguay, Hovhannisyan, who oversees affiliate operations and projects, met with various local Armenian community representatives to discuss the Fund’s programs and goals, helping to pave the way for the launch of the local offices in Argentina and Uruguay. Hovhannisyan’s two-week mission kicked off in Sao Paulo, Brazil, where he was honored with a fundraising dinner organized by Diruhi Burmayan, a local trustee of the Fund. Proceeds from the event, which was attended by a large number of prominent Brazilian-Armenians, will benefit renovations at Yerevan’s Nork-Marash Hospital. For over two decades, the Brazilian-Armenian community has been an outstanding supporter of humanitarian and development projects in the Armenian homeland. Prior to the creation of the Hayastan All-Armenian Fund and in the wake of the 1988 Spitak quake, Brazilian-Armenians founded the Earthquake Committee, an aide organization which eventually led to the formation of the Fund’s local affiliate. Brazilian-Armenians were among the first diaspora communities to assist in the construction of the Goris-Stepanakert Highway, one of the Fund’s most ambitious pan-Armenian projects. Today, the Brazilian affiliate supports a number of major humanitarian and healthcare projects in the homeland. The Fund’s Argentinean affiliate, formed in 1992, is based in Buenos Aires, home to the vast majority of Argentina’s 70,000-strong Armenian community. The country’s second largest Armenian hub is found in Córdoba, with a community of 10,000. It is here that one of the two newest affiliates of the Hayastan All-Armenian Fund was established last month, making Argentina the third country — after the United States and Canada — with two Fund affiliates. During his visit in Argentina, Hovhannisyan held meetings with Fund trustee Eduardo Seferian, supporting member Jorge Vartparonian, and several other community leaders. With appearances at various local Armenian organizations, Hovhannisyan made detailed presentations of the Fund’s current projects and programs while articulating its vision for the future. After an eight-year hiatus, the Fund’s affiliate in Montevideo, Uruguay, was reopened during Hovhannisyan’s visit. The affiliate will enable the relatively small Armenian community of Uruguay to streamline its efforts to assist the homeland. 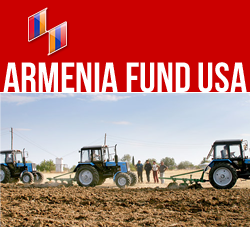 Today, the Hayastan All-Armenian Fund has 20 affiliates in 17 countries.